The Programme for the Endorsement of Forest Certification (PEFC), is hosting their 2016 Stakeholder Dialogue event in Bali, Indonesia this November. The two day event will be dedicated to discussion, debate and exchange on how the forest sector and forest certification can better contribute to sustainable landscapes for sustainable livelihoods. The EWPAA works to promote sustainable forest management and sustainable wood products through provision of Chain of Custody (CoC) certification to AFS and PEFC requirements. The CoC standard aims to provide organisations with a credible system for tracking products from certified forests through all phases of the supply chain to the consumer. EWPAA certification against AFS/PEFC CoC standards provide a clear statement that wood has been sourced from certified and sustainably managed forests. Sustainable forest management provides sustainable economic activity in regional economies and employment in regional communities. The Stakeholder Dialogue event will open with two distinguished experts providing diverse views on how to ‘bridge the gap’ and better achieve sustainability across forests, agriculture and food security. Dr. Terry Sunderland, Principle Scientist at CIFOR, will share his insights on how landscape approaches can provide a framework to reconcile competition between productive land-uses and environmental and development trade-offs. He will also highlight new findings that underscore the importance of forests for many aspects of sustainable development, people’s nutrition among them. Dr. Sadanandan Nambiar AO, (formerly, Chief Research Scientist, CSIRO, Australia) will argue that improving the productivity and profitability of forests and trees is central to achieving sustainability across landscapes and livelihoods. For Dr. Nambiar, certification must sharpen its focus on economic sustainability. The production, processing and use of more wood is critical for poverty reduction and a contributor to climate change mitigation, and he will challenge whether certification systems currently act as a catalyst for rural development in tree-based landscapes. Visit the PEFC Week website for more information and to register for the event. Wide experience in communications and public relations supports the talents of Clair Hammond who has joined the team at the Engineered Wood Products Association of Australasia. Clair has been appointed Communications Officer and will promote the importance of fitness-for-purpose, product performance and sustainability that sit behind the EWPAA’s certification mark. She will also be coordinating internal communications and events among EWPAA members. Clair graduated from the Queensland University of Technology with a Bachelor of Business (Public Relations). After graduation, she worked in publicity and communications for Charlton Brown, a community services agency and training organisation. She moved to Canada in 2014 to live and work on the ski fields of Whistler, combining her passions for travel and the snow. Clair returned to Australia in May this year and is excited to be back in Brisbane and in a role applying her communications knowledge and skills with the EWPAA. 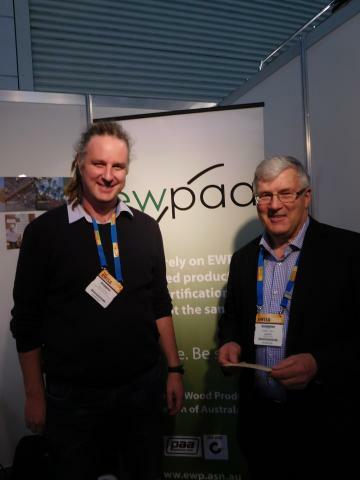 Talking new engineered wood products and product certification on the EWPAA stand at AWIS 2016 in Melbourne are CEO Dave Gover (left) and Robin Jack, Director of Xlam in Auckland. During the event, Mr Gover met with Dean Brackell, CEO of the Furnishing Industry Association of Australia on the FIAA stand. “Dave’s a great guy; were are going to collaborate on a number of industry initiatives – new engineered wood products, standards and the continuing promotion of zero emissions in Australian furniture,” Mr Brackell said. 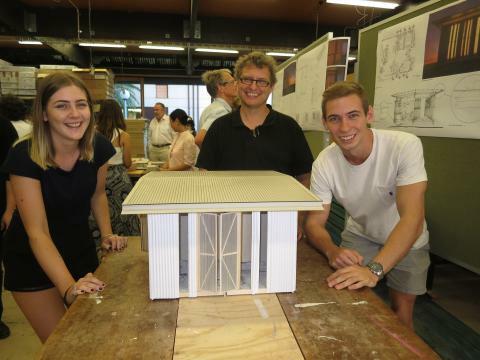 Masters students at the schools of architecture and civil engineering at the University of Queensland have combined their skills in a humanitarian aid project to design small-scale modular houses, based on engineered wood systems. Conceptual drawings and models for the project were presented at a workshop at the School of Architecture’s ‘co-lab’ at the St Lucia campus this week attended by State Government Infrastructure Officers Project Stakeholders, External Engineers, Building Contractors, Architects and representatives of the Engineered Wood Products Association of Australasia who evaluated four student systems under review. The enthusiasm and teamwork of students driving the innovation impressed the visitors; it showed the teams were effectively learning from each other, developing interdependence and accountability and a sense of self-esteem. Michael Dickson, academic adviser and lecturer at the School of Architecture, explained that the program is aimed at producing affordable prefabricated housing that can exist as a secondary dwelling and constructed using semi-skilled labour to drive down costs. “This is unlike other modular housing built completely in a factory,” Mr Dickson said. “It’s more like an Ikea approach to prefabrication.” He said the compact house, designed to be carried to and fitted on a 25 sq m site, could be used as a grannie flat, teenager’s ‘pad’ or home office. “However, our particular project, which will see the four student systems incorporated into one design, will produce a home for young women transitioning from state care or a single parent with a young child,” Mr Dickson said. The master design with additional innovations will be the basis for the first house to be built and completed at the UQ campus in about four weeks. The house will form the centre of a workshop ‘open house’ inspection from 15 July to 7 August – the University of Queensland’s Open Day. Invitations will be sent to project stakeholders, government departments, designers and specifiers, the housing industry sector and project supporters such as EWPAA. After this, the house will be moved to a selected site in inner Brisbane for occupancy. Mr Dickson said the use of engineered wood in the project was the natural solution. “Wood is forgiving; if we need to make design changes we can do it quickly and economically – something you can’t do with a thick steel frame,” he said. Funds for the initial project have come from within the architecture and engineering faculty. However, Mr Dickson said he hoped this would raise interest and secure additional outside funding over five years. Dr Ron Blackwell, Associate Professor at the UQ School of Civil Engineering, will be the certifying engineer for the project, which has involved six students from the school. Dr Blackwell said two academic members of the school had been appointed to research the fundamentals of engineered wood systems – which was a ‘first’ for Civil Engineering at the University. “They have a timber and fire engineering background and their lectures in this field are something we haven’t had at this level,” he said. “I believe the EWPAA can contribute in a big way, potentially in a more formal manner.” The program to design a small, prefabricated house that can be carried into a backyard is allied to another project within the architectural technology course for third-year students at the University of Queensland that aims to extend an existing building on campus using large-span engineered wood structures. Photo: Michael Dickson, UQ School of Architecture, discusses modular house systems with Civil Engineering students Tiara Davis and Josh Briggs at a University Workshop Presentation. Because of relatively modest replacement rate of existing building stock in Australia, it will be more than half a century before all buildings achieve the current level of performance exhibited in new buildings. That’s the opinion of Dr Paola Leardini, a senior lecturer and technology stream leader at the University of Queensland’s School of Architecture, who is working with students on design concepts for relocatable flat-pack buildings, using engineered wood. More than 90 second-year architectural students are completing a building technology course under the tutelage of Dr Leardini in a housing efficiency project supported by the Engineered Wood Products Association of Australasia. Dr Leardini has studied architecture with a focus on green technologies in Milan, Berlin, Leicester and Copenhagen, and holds a PhD on energy efficiency and IEQ of office buildings from the Politecnico di Milano (Italy). Shei has worked as an ESD designer and consultant, and taught in tertiary institutions in Italy, Switzerland, Germany and New Zealand. 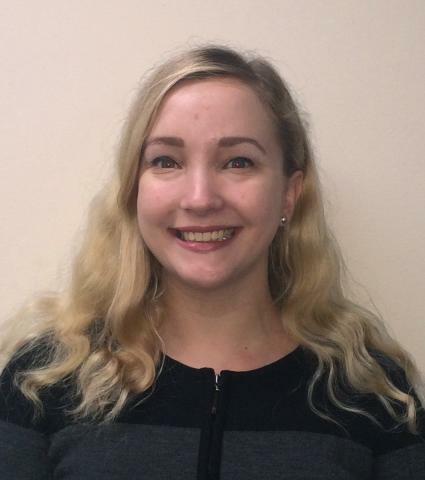 Her main research focus is on energy performance and thermal comfort of new and existing building stock, including investigation and assessment of multiple intervention strategies for low to positive energy buildings. Her studies on comfort and energy efficiency of new and historic residential buildings have been published internationally. Dr Leardini says research is required to verify the impact of both voluntary rating tools and legislative measures to promote energy efficiency within the existing building stock and to increase the rate of its refurbishment. This research will include a detailed evaluation of the existing commercial building stock within the major Australian cities and the identification of barriers to the implementation of sustainability refurbishments. The research will assess a large sample of existing commercial buildings to determine suitable retrofit strategies, the energy, and cost savings of undertaking major refurbishment and the effect on capital value of such refurbishments. This research project may be developed in collaboration with UQ Business School, the UQ School of Geography, Planning and Environmental Management, the Green Building Council of Australia and commercial real estate partners. In the relocatable buildings project, the UQ architectural students are constructing pre-fab models, using AFS certified structural BB plywood sheets 1800 x 1200 x 44 mm supplied by EWPAA member Austral Plywoods in Brisbane Austral, operating since 1925, is Australia’s leading manufacturer of premium grade plywood manufactured from 100% plantation hoop pine. The company’s chain of custody, linked to the Australian Forestry Standard, was awarded through the EWPAA audit process. John Stafford, technical officer at the UQ architecture workshop, said his visit to Austral Plywoods had been a real eye-opener. “I just didn’t realise such a high-tech plywood factory operated on our doorstep,” he said. “I absorbed a lot of information from principal Scott Mathews, especially about Austral’s ability to rotary-cut its own veneers, producing A-Bond products with a Super EO rating.” Mr Stafford said the architectural students were expected to complete the models for the pre-fab project within five or six weeks. 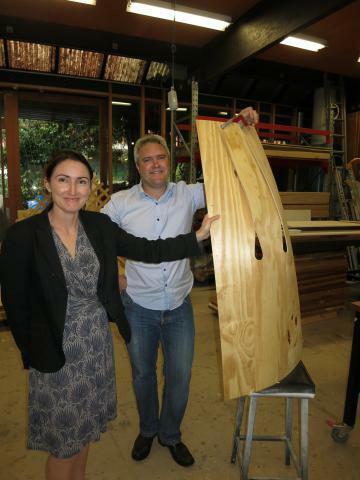 Photo: John Stafford, technical officer at the University of Queensland’s architecture workshop (left), with Scott Matthews of Austral Plywoods, which supplied structural plywood sheets for a relocatable flat-pack building design project by second-year architectural students. An interactive installation bringing together technology, art, architecture, science and engineered wood will be exhibited at the State Library of Queensland next month. Co-sponsored by the Engineered Wood Products Association of Australasia and EWPAA member Wesbeam, the project is part of the inaugural Asia Pacific Architecture Forum, which coincides with the World Science Festival Brisbane and the 8th Asia Pacific Triennial of Contemporary Art. Initiated by the University of Queensland’s art museum as part of a broader program to engage students and academics in a creative nexus of the arts, science and environment, ‘Sulcus Loci’ brings together seven organisations across the university. Working in partnership with Queensland Brain Institute’s Luke Hammond, Brisbane artist Dr Svenja Kratz was commissioned by UQ’s School of Architecture to interpret QBI’s extensive collection of brain scans for the exhibition. Using these brain scans, Dr Kratz developed a conceptual brief for students in UQ’s Master of Architecture, Master of Multimedia Design, and Master of Interaction Design programs, challenging them to collaboratively create an immersive exhibition environment. Curator John de Manincor from the School of Architecture says Sulcus Loci promises to provide visitors with an immersive architectural experience. “It’s an interactive architectural pavilion that houses an experiential artwork developed by Dr Kratz and UQ’s School of Music composer Dr Eve Klein,” Mr de Manincor said. The timber frames are a series of pentagonal portal frames, made of 130 x 45 LVL beams, with plywood gusset joints that produce the required portal stiffness. Each Portal frame is unique in size and location relative to the next, which allows the overall form of the pavilion to take on a bespoke, organic volume in its interior. The form responds to the sculpture in the interior by Dr Svenja Kratz, allowing viewers to enter through a small opening in the ends. The interior can expand into a large encapsulating volume. Mr Baber praised the generous donation of LVL donated by Wesbeam, personally thanking the support of the Perth-based company’s Quality Assurance Manager Dr Ahsan Qureshi. The portal frames are ‘woven’ together with a series of thin plywood bands that provide bracing and overall stiffness in the structure. Suspended from within the LVL portal frame structure is a taut fabric membrane with imagery of brain neurons projected onto it. As viewers enter the space, they are invited to stretch and interact with the fabric, which in-turn triggers responses from the projections. Dr Stephen Viller of UQ’s interaction design program notes visitors will be able to immerse themselves in an experience that highlights the interconnection between neuroplasticity and the human-environment using advanced physical computing systems. Utilising the impressive image library generated by researchers at QBI’s microscopy unit, Sulcus Loci creatively combines art, science and the environment into one exciting showcase. Sulcus Loci will be open to the public at the State Library of Queensland from March 1 running until May 15. Monique and Kim Baber Architects Guiding Design and Construction. Creative challenge: Students at the University of Queensland have accepted a brief to design and construct a unique structure combining a static timber frame and an interactive fabric ‘skin’. Australia’s reputation as a manufacturer of zero-emission and structurally-compliant engineered wood products that meet global certification standards was further enhanced during EWPAA presentations to Japanese government officials last month. EWPAA CEO Dave Gover and quality systems engineer Andrew McLaughlin were in Tokyo for talks with the Ministry of Agriculture, Forestry and Fisheries, focussing on market and industry conditions in Japan and future opportunities for engineered wood products produced by EWPAA members. 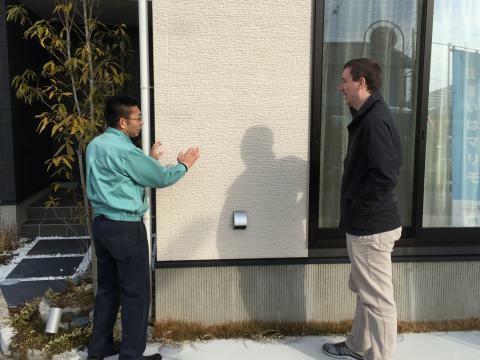 The photo; EWPAA quality systems engineer Andrew McLaughlin (right) and Shinichiro Naoi of Japan-based Wood One discuss airtight building systems to manage internal air-quality, and product emissions. Mr Gover said government building policies in Japan had a heavy emphasis on emissions-free and accredited timber in the residential and commercial sectors. During the EWPAA visit, building systems, including techniques to manage internal air-quality and product emissions, were inspected at Wood One Pty Ltd, a major international housing materials and componentry business and parent company of EWPAA member Juken New Zealand Ltd.
Wood One has invested more than $NZ700 million in technology and resources to further develop Juken’s high-quality manufacturing base. The EWPAA mission enabled tabling of documents with the Ministry of Economy Trade and Industry (METI) prior to renewal of the association’s Japanese Industrial System (JIS) accreditation, followed by meetings with the National Institute of Technology and Evaluation which will conduct the accreditation audit on METI’s behalf. Fundamental to JIS accreditation is controlling product emissions. The busy round of meetings included discussions with the Food and Agriculture Materials Inspection Centre (FAMIC) to discuss interpretation of the JAS LVL standard. Mr Gover said the respected Japanese Agricultural Standard (JAS) is a requirement for plywood and LVL products going into the Japanese market. Clear product labelling and registered quality certification marks is an important factor. “Engineered wood faces exciting challenges and a wealth of opportunities – all delivered under the EWPAA’s ‘gold standard’ for product certification,” the association’s newly-elected president Michael Murphy said this week. “The aim is to focus our new directions on a single brand name, underpinning EWPAA’s commitment to bonafide building standards and services that are critical to its membership in Australia and New Zealand,” said Mr Murphy who was elected at the EWPAA’s AGM in Brisbane on November 11. He said the new EWPAA CEO Dave Gover had “hit the ground running” and had wasted no time in visited all members. “My role as chairman will be to support Dave in the consolidation and strategic direction of EWPAA going forward,” he said. 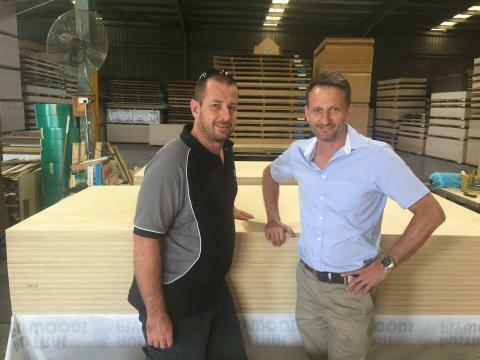 Mr Murphy, who is marketing manager, LVL, with Carter Holt Harvey Woodproducts in Melbourne, succeeds Brendan Smith, site manager for Juken New Zealand’s plywood and sawmill operations at Gisborne. Stuart Toakley, sales and marketing manager at Borg, was re-elected vice-president and Andrew Close, commercial manager, CHH Woodproducts, based at Mount Gambier, SA, takes over treasurer duties from Jim Bindon, managing director of Big River Group, Grafton, NSW. Michael Murphy began his career in the industry in 1987 at Timberbuilt Solutions in Melbourne, working under his mentor Bruce Hutchings, considered Australia’s LVL-based building systems guru. During his time at Timberbuilt, Mr Murphy went on to gain an honours degree in civil engineering from Monash University, graduating in 1989. When he received his degree, he was put on full time at Timberbuilt. 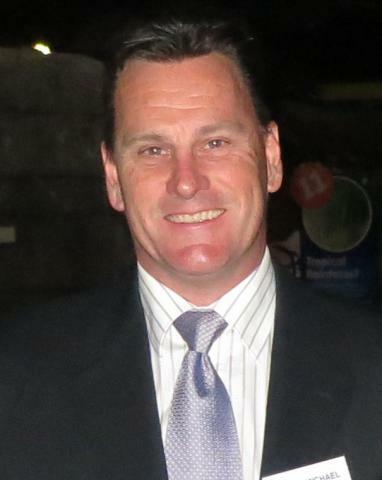 He later joined Carter Holt Harvey after the company purchased the LVL plant at Nangwarry in South Australia, and he has been with the company ever since. 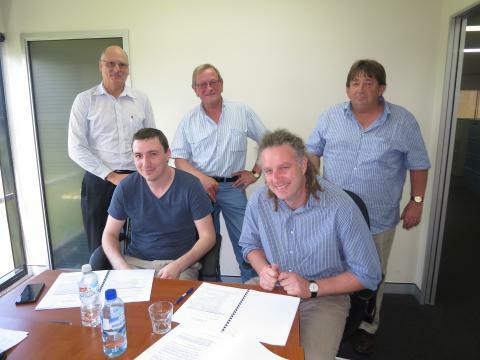 The Engineered Wood Products Association of Australasia will continue in its commitment to product certification and conformance credentials of building materials entering the market. The Engineered Wood Products Quality Committee meeting in Brisbane this week reviewed its agenda to maintain rigorous, ‘watertight’ standards to ensure products are safe and absolutely fit for purpose – an ongoing commitment in the face of increasing risks of sub-standard building materials entering the Australian market. The Quality Committee includes representatives with expertise from across the timber supply chain and specifier communities. The meeting, chaired by Dr Harry Greaves, focused on presentations by EWPAA CEO Dave Gover, Laboratory Manager Suzie Steiger, and Quality Systems Engineer Andrew McLaughlin. EWPAA’s laboratories at Eagle Farm are accredited by the National Association of Testing Authorities (NATA) and test EWPAA certified products for a full range of structural and physical properties and for formaldehyde emissions and bond quality. Samples from member plywood, LVL, particleboard and MDF mills are tested daily. The certification schemes are independently accredited by the Joint Accreditation System of Australian and New Zealand (JAS-ANZ). “Through manufacturing innovation, robust quality control, and adherence to Australasian product standards, the wood products industry is committed to providing a reliable, sustainable, and renewable material for building construction” EWPAA CEO Dave Gover said. He said EWPAA was positioned to expand its influence as a high-profile and respected industry organisation and certifier of conforming timber products. “Our priorities in developing and strengthening markets include on-going measures to ensure products used in Australia comply with Australian standards,” Mr Gover said. “We accept that imports are a reality, but there must be a level playing field and products used in Australian buildings must comply with Australasian standards. Structural safety and the health and well being of building occupants is essential. The EWPAA brand is a mark of confidence that a timber product meets these requirements. Members of the EWPAA technical committee ..
Jim Zacharin, Cabinet Timbers, Moorabbin, Vic. 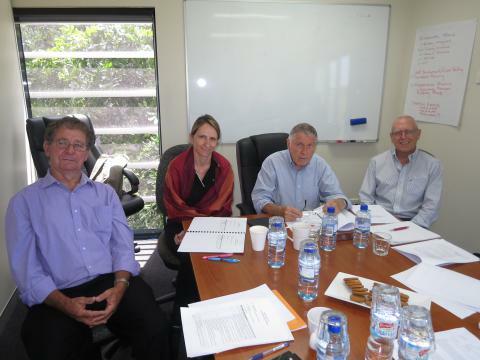 Technical committee discussions at EWPAA offices and laboratory in Eagle Farm ..
Peter Juniper, Juniper Consulting, Melbourne.